The NT370 Atlas Nitrle Touch is incredibly flexible and lightweight and has tough Nitrile coating which protects hands. These lightweight nylon knit gloves fit like a second skin. These ultra thin gloves let you feel what you're doing, weeding, thinning, pruning, even picking up individual seeds. It has tough nitrile coating over ergonomically shaped, seamless knit for unprecedented comfort, dexterity, and durability. The glove is available in four assorted colors mainly green apple, pink, purple, and blue. 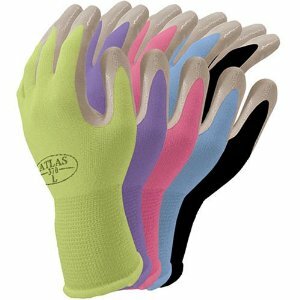 Atlas Nitrile Touch gloves are available in four assorted colors and black. These gloves stand up to repeated machine washings, and can be dried quickly. NT370 Atlas Nitrle Touch is tougher than rubber; the nitrile coating protects palms and fingertips from the hazards of serious gardening.